Being known amongst pioneering and trusted firm, we are known for offering a large rage of Biscuit Sandwiching Machine. 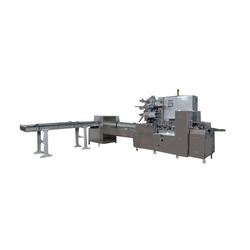 To sandwich wide array of biscuit shells, this Biscuit Sandwiching Machine is widely used. The Biscuit Sandwiching Machine we offer is easy to operate and cream is sandwiched between biscuits by functioning it. Our Company is one of the reputed names in the market for offering a wide assortment of Biscuit Sandwiching Machine at very affordable rates. The machine is required to put cream between the two biscuits automatically to make sandwich cream biscuits. The machine is available in various designs, such as stencil type, wire-cut type and with 2 / 4 rows, high speed type with stacking system and row multiplier. 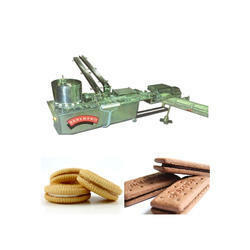 As an important entity of this domain, we provide the first class quality of Biscuit Creaming Machine. With an objective to fulfill the ever-evolving demands of our clients, we are engaged in offering a wide assortment of Biscuit Cream Sandwiching Machine. Our Company is one of the reputed names in the market for offering a wide assortment of Cream Biscuit Sandwiching Machine at very affordable rates. the single cream biscuit sandwiching machineis used for creaming the biscuit of a single color/ type of cream. The machine can be made to operate at different speeds as per requirement. - sandwiches are stacked on edge in rows on take-off conveyor for easy packaging. We manufacture of wire cut type cream biscuits sandwiching machine, which is designed to produce a wide range of biscuits sandwiches in various shapes and size. Cream deposit can be uniformly thick or thin large or Small Square or rectangular, as required to match base biscuit size and shape. We have an eminent name for offering a vast array of Biscuit Creaming System This product is manufactured using only quality tested materials.